While some teams are seeking a big splash at the MLB Winter Meetings, the Tampa Bay Rays have made a smaller but significant one. 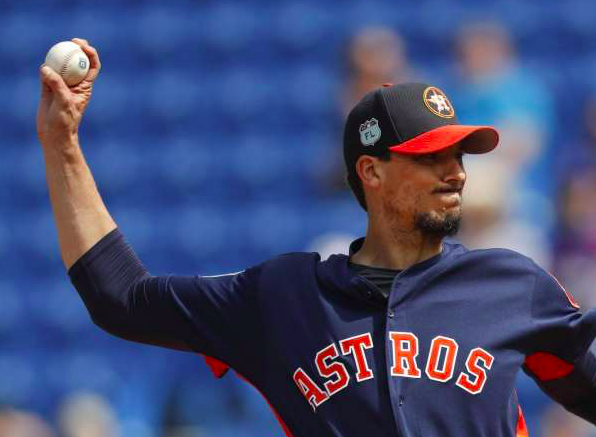 On Wednesday, the Rays agreed to terms with free agent pitcher Charlie Morton. The deal is reportedly worth $30 million over two years. While he was overlooked by many of the teams seeking a frontline starter, Morton is a nice pickup for the Rays, who are trying to improve upon their 90-win season in 2018. Not too long ago, the now 35-year old Morton looked all but finished in the majors. A hamstring injury limited him to just four starts in 2016 as a member of the Phillies. But the Astros took a chance on him the following offseason, giving him a two-year deal with a modest $14 million. Morton ended up delivering on that contract and then some over the past two seasons. In 2017, Morton went 14-7 with a 3.62 ERA over 25 starts. Despite modest expectations heading into the season, he became a key member of Houston’s rotation. He also made four starts and one relief appearance in the postseason, helping the Astros win the World Series. This past season, Morton was even better. He made 30 starts, going 15-3 with a 3.13 ERA. After that kind of season, one would have thought Morton would be one of the top starters on the market. However, interest from big market clubs was lacking. That enables the Rays to swoop in a potential bargain. For Tampa Bay, committing $30 million over two years to one player could be considered a wild shopping spree. However, if Morton’s two seasons in Tampa Bay are anything like his last two seasons in Houston, the Rays will still have found quite a bargain. If there’s one thing the Rays are lacking right now, it’s starting pitchers. At the moment, Morton figures to headline Tampa’s rotation alongside Blake Snell, who won this year’s Cy Young award in the American League. The club is also high on youngster Tyler Glasnow, who they acquired in a trade with the Pirates last summer. The remaining spots will likely be filled with some of the team’s young prospects, some of whom are coming back from Tommy John surgery. Of course, the Rays employed a unique system of using “openers” last season. They would use one of their top relievers to pitch the first inning or two before handing the game over to a starter. Snell was one of the pitchers the Rays used as a traditional starter. However, it remains to be seen if Morton will get the same treatment. Morton averaged less than six innings per start in 2018, so he could benefit from entering a game in the 2nd or 3rd inning. However the Rays end up using him, they will be thrilled to have signed Morton. He doesn’t throw that hard or have flashy stuff, but he’s just as productive as almost any other pitcher in baseball. If the 2018 season was any indication, Morton has a lot left in the tank and should have no problem continuing to perform at a high level for at least another two years. Most importantly, the Rays are a much better club than they were before signing Morton.